Follow me on Twitter. Fan us on Facebook . Visit our Flickr photostream. Festive season brings cheers, laughter and rendezvous with family and friends. It also brings High calorie foods and weight gain. The last month being the time for merriment and holidays, I’m sure most of you have put on some weight [due to the booze, the sloth, the endless party nibbles says this Telegraph article]. Most likely, you have made a New Year resolution (oh that annual word!) to have low calories healthy diet at least for next 2 months. In the next 30 days, lets write about Salads. Any type of Salad – green, entrée, barbecue, fruit salads. You can also write about Raitas of any type – mixed, cucumber, fruits, boondi, or something different. 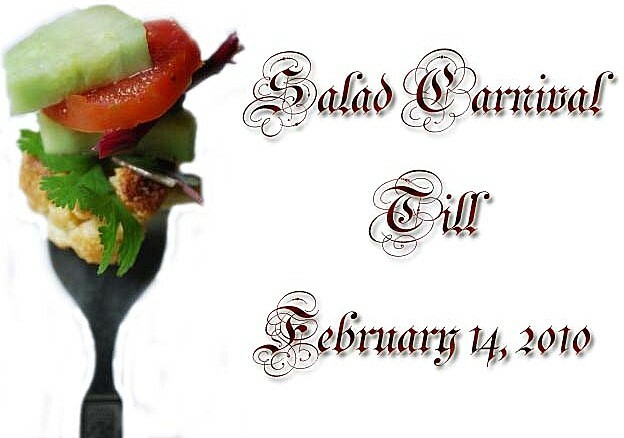 Write about a salad on your blog between now and 14th February 2010 with a link back to this event announcement. I’ll be glad if you use the event logo, it’s optional though. The salad may be vegan, vegetarian or non-vegetarian. If you have any archived post that you want to send, please update the post with the link to this event. No need to repost. Those of you, who don’t have a blog, please feel free to email your recipes to the id above. Your recipe will be published at the time of round-up with due credit to you. ‘Salad’ derives its name probably from the Latin word “sal” meaning salt, which was one of the important ingredients of salad. Wiki says that salads were probably eaten by the ancient Greeks and Romans even two thousand years ago. Though, most people avoided salads because of disease contamination from raw vegetables. Salads started growing in popularity during the 18th and 19th centuries with the emergence of various salad bars. Salads on the basis of their ingredients, dressing and the way they are made can be differentiated into various types. The very popular ones being the Ceasar salad, Greek salad, Italian chopped salad. Ms. Shulman wrote on the New York Times about five different salads which are a little different from the regular ones, the main ingredients being grains, beans, potatoes and eggs. We would love to hear more about salads from you, if you want then please share your thoughts and any related incidents with salads. You can put in a comment here or mail us at bengalicuisine@gmail.com . By the way, do you know any Bengali Salad? The video features Kim Kardashian. No wander why is it so popular. It’s a toss up between Ceasar salad, Greek salad for me. .-= Rujuta´s last blog ..Mushroom Rice =-. Please do send in your entries :), would be waiting for your submission. I am an ardent Salad lover. Will definitely participate in the Salad event. The email address given above has typo.Pls correct . Many thanks for pointing that out. Have corrected it now. Looking forward to participation from you. I am in with at least 2 to 3 entries. .-= Nivedita´s last blog ..Mixed Lentil Dal =-. We all love salad..and its a terrific idea of having this carnival going around in this season..shall definitely try to send something. .-= Muskaan Shah´s last blog ..Mung Bean/Moong Dal Halwa for ICC – Aspartame Free & Sugar Free & Low Cal =-. Thanks so much for dropping by. Would be waiting for some lovely recipes from your end. Oh thanx a ton for letting me know-am hoping…actually no i’ll be in -we all love salads….have a wonderfully happy day!!!!! .-= sugar plum´s last blog ..BABY RUGELACH-HAVE THE CAKE BAKES A BUTTERY TENDER MELT IN UR MOUTH COOKIE THIS MONTH =-. I love salads Will definately send in an entry for this soon. .-= simplyfood´s last blog ..Stir fried noodles with baby corn and carrots. =-. Sorry, I won’t be partcipating, as my focus it bread and pizza. But I’ll pass it along to my wife, who is THE salad diva. Thanks and Happy New Year! Thanks a lot for dropping by. Do let your wife know about the carnival, I’ll be glad to receive some wonderful entries from her.